Spread out a 375g pack of Saxby's Ready Roll Puff Pastry or roll out a 500g block and trim to a 30cm round. Place on a damp baking sheet and prick all over. Roll out 150g marzipan to a slightly smaller round and place on top of pastry. Cover with 3 Cox apples, peeled, cored and sliced. Dot with 25g of butter and sprinkle with 2 tbsp caster sugar. 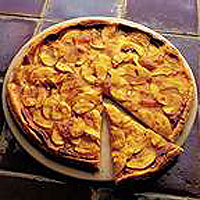 Bake in preheated oven 200°C, gas mark 6, for 25-30 minutes, until pastry is golden and the apples tender. Brush with warmed apricot jam. Serve warm or cold. Great with ice cream.